I have been wearing this sweater non stop. I loved off the shoulder styles this past spring & summer (see looks here & here) and was sad to put away my OTS pieces as fall arrived. 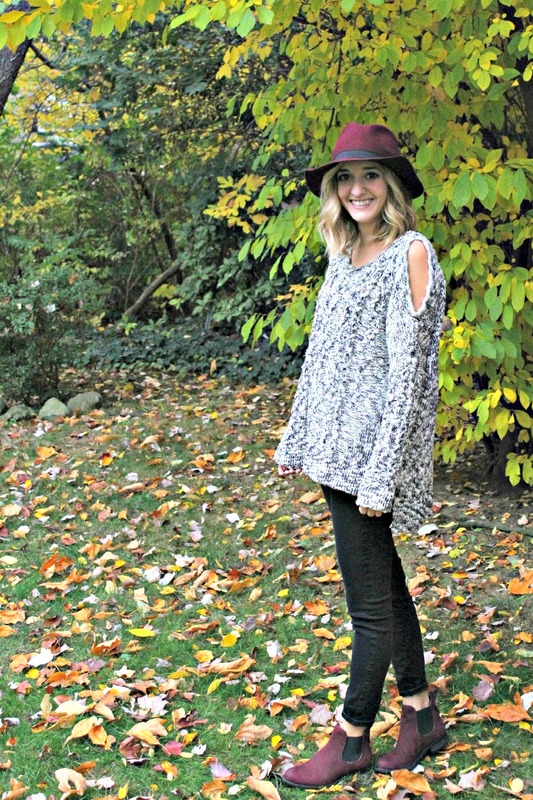 This sweater is perfect because it allows me to keep the cold shoulder trend going in a much warmer way. This sweater is a classic and cozy, but the cut out shoulders add a fun, modern touch to this piece - a must have for me for this season! PONCHOS - Ponchos & capes were super popular last winter and are still just as on trend this season. I love neutral colored capes with patterns or more simple cozy ones! I recently wore an oversize gray poncho that was great for a chilly morning. TURTLENECK - Whether you wear a mock turtleneck or a classic fitted style, a turtleneck sweater is a must have for the coldest days of winter. This sweater style is classic and effortless and can be paired with just about anything from jeans to a skirt. Slim turtlenecks also make great layering pieces under dresses or sleeveless tops! See how I styled a sleeveless turtleneck here. CARDIGAN - I couldn't forget the cardigan style sweater. One of the most classic sweater styles for fall & winter, many times these sweaters add a preppy vibe to a look. I love duster styles with a tunic top, leggings and boots. What is your favorite type of sweater to wear? Which type do you want to see styled? I love this sweater with the cutout shoulders. I also love how your styled it with the burgundy hat and booties. You look fantastic. Those booties and that hat are gorgeous in this outfit! 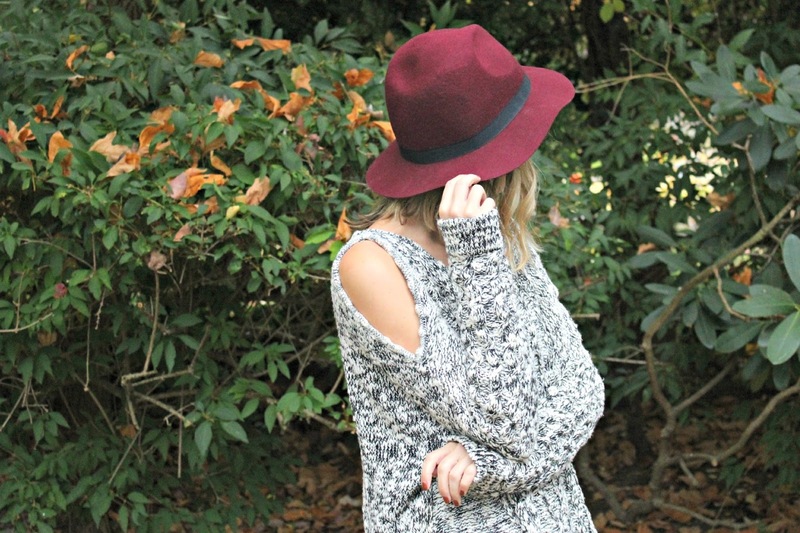 I love the marled sweater and touch of maroon! Grey and burgundy are two of my favourite colours together! beautiful. Me too - I am also loving navy this season! Love the jumper especially paired with the burgundy accessories! love how your boots match perfectly with your hat. That cold shoulder sweater is so cute! 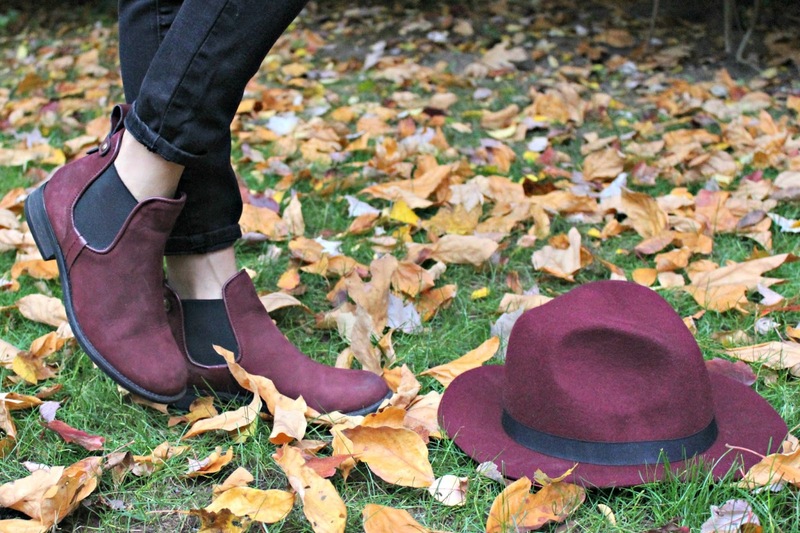 Love the burgundy hat and booties with it! I love the cold shoulder details! They add a certain chicness to the look :) I'd say my favorite kind of sweater is cardigans! Cardigans are so easy to toss over a top! I can see why they would be your favorite! I'm in love with winter foliage and these photos with that burgundy are perfectky matched with the enviroment. Me too - I'm going to be so sad once the leaves are all gone! LOVE this look. It just screams Fall. 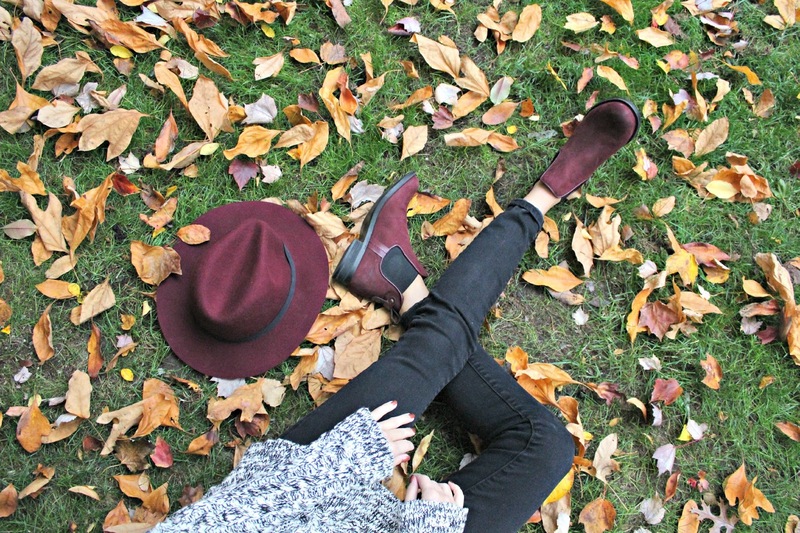 Nice accents with the burgundy hat and booties. You look amazing as always! Thanks! I love adding some pop of color into each look! Your sweater and hat are both so gorgeous. I agree about all the choices of sweaters you suggested. I will always love a cardigan but I am loving poncho-style sweaters this year. Also your marsala booties and hat are so pretty and match so well together. Thank you! I think having a variety of sweaters is fun to help get through the cold months of winter!